Small chunks of the satellite may be seen to break off and trail behind the main body. (NASA expects up to 26 pieces from UARS to survive re-entry and reach the ground.) If the re-entry occurs at night, it could light up the sky with a brilliance that easily rivals the full moon. Even if it occurs during the daytime, the satellite's fiery passage across the sky could be readily seen. Notes veteran satellite watcher Kevin Fetter: "A nice sized [satellite] with a uncontrolled re-entry. What a nice light show it should put on, if the decay occurs where people can see it." According to NASA, there is a 1-in-3,200 chance that debris from UARS could hit anyone anywhere in the world, but your personal chance of being struck by a piece of debris is on the order of 1-in-several trillion. The satellite, which was deployed by the space shuttle Discovery in 1991, was decommissioned in December 2005. The $750 million UARS was the first multi-instrumented satellite to observe numerous chemical constituents of Earth's upper atmosphere. When and where will UARS fall? As to when UARS is destined to come down, the best estimates right now seem to be focusing on an interval roughly 18 hours long, running from midday Friday to early Saturday. 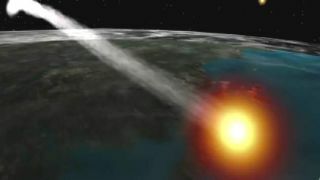 Ted Molczan, the moderator of the SeeSat Internet mailing list, utilized six sets of orbital elements obtained from the U.S. Strategic Command to derive a possible window for re-entry. His calculations suggest that UARS could re-enter anytime from Sept. 23 at 1432 GMT (10:32 a.m. EDT) to Sept. 24 at 0648 GMT (2:48 a.m. EDT). Another SeeSat member, Harro Zimmer of Berlin, Germany, predicts Friday at 2004 GMT (4:04 p.m. EDT) plus or minus five hours, and descending on 19.1 degrees north, 128.5 degrees east ?over the West Pacific near the northwest coast of Japan. NASA says Tracking and Impact Prediction messages ("TIPs") will be prepared and released to the general public two days, one day, 12 hours, six hours and two hours ahead of the UARS re-entry. But even two hours before re-entry, the average time uncertainty amounts to 25 minutes for nearly circular orbits. This works out to plus or minus 12,000 miles (19,300 km) on the Earth. Keep in mind that only the track during the final revolution over the Earth can be forecast, and not the exact geographical location of the satellite's burn-up. Unpredictable tumbling of any space vehicle as it collides with the denser air can alter the drag forces acting upon it or produce an aerodynamic lift that can deflect it from its projected path.